An ordeal? Well maybe, but I’ve seen worse. Canby did allow that Saragossa does have “the grave good humor of Polish film” and that it was spirited if “often (a) completely incomprehensible mélange of tall story, miller’s tale, surreal dream and philosophical double-talk.” ... all true. Today Juliet is as antique as Saragossa. 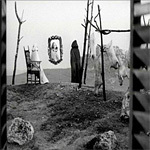 I think this plays in Saragossa’s favor as it can been seen outside the context of fashion. Where most modern viewers are going to be left in the lurch is in Saragossa’s complex story-within-a-story structure... that, and there are no giant robots. But all is not lost, Saragossa does have zombies rising from the dead! Saragossa Manuscript is taken from a Polish novel of approximately the same name written in 1815 and both are built around the literary device of a “frame narrative,” a story that serves to introduce another story. The sense I got was that the characters are themselves simply frames for their stories like the story-tellers in Canterbury Tales (as Canby notes) or The Decameron. And that story often leads to yet another one... a tale within a tale within a tale like a Russian nested doll. The joy in watching this film comes in the flow of one story opening up within another. Trying to keep all the plots in order or in relation to each other may be futile. But then I’ve only seen the film once and this is a film that begs to be seen again and again. Saragossa is mainly an 18th-century costume piece set in Spain, though the introductory frame is set in the Napoleonic wars. Two opposing officers meet in an abandoned inn and, setting their war aside, sit down together to read a strange and ancient tome: the Saragossa Manuscript. “Ah”, says one of the men, “this is about a relative of mine.” They then dive into the book and are not seen in the film again. The scene shifts to a treeless and surreal rocky alpine landscape where we meet the Napoleonic officer’s ancestor. It is Alfonso van Worden (Zbigniew Cybulski) who along with his two servants is traveling to Madrid. In as much as there is a central character in Saragossa,it is van Worden. He’s looking for a shortcut through the mountains and has led them into a eerie and perhaps haunted place. The servants disappear and Van Worden wanders to an abandoned inn where he is seduced by a pair of women who are ghosts/sisters/lovers. Is he really lost or has he been drawn there by these supernatural hotties? He also meets a pair of gypsy brothers who are hanging dead from a gallows in one scene and alive rescuing van Worden from the inquisition in another. We hear van Worden tell the story of his father, a comically compulsive dueling aristocrat. A old hermit/monk appears and takes van Worden in... more tales ensue. At this point the viewer should release the reins of the film’s narrative as it’s about to run wild. The film becomes a sort of X-Files meets Barry Lyndon with its satin and powdered wigs, dueling aristocrats, supernatural secret agents, hidden agendas, and mystic societies. More stories are told... and stories within stories. Curiously the deeper we go into the nested narratives, the more un-supernatural they become. It is the uppermost narrative that has all the ghosts and is most bizarre. Maybe 1972 just wasn’t the right time for Saragossa. But I’d like to think that today’s fans of Guillermo del Toro’s Pan’s Labyrinth (or for that matter his Hellboy films) would be open to its surreal fantasy. Today Saragossa is being pitched as a cult film once championed by Jerry Garcia. Why that would validate it as a great film (which it is) is not clear. Also on the fan list is Francis Ford Coppola and Martin Scorsese whose cinematic opinions do carry more weight. If you’ve got the urge to pull an old film down off the shelf — one you’ve probably never seen before — Saragossa Manuscript is for you. And has it got a story to tell! There are only one or two: there is a set of stills from the film. The cover lists “isolated music score” but I did not see that. Picture quality is good and the subtitles are legible. The sound is a little rough, though. Check out the scene list for a good outline of what’s happening to the narrative. It’s as good a guide to the film as you’ll find.